For the information and guidance of all concerned, enclosed is a Memorandum from Undersecretary Jesus L.R. Mateo, regarding the clarification on the requirement of Birth Certificate upon enrollment in DepEd Public Schools. 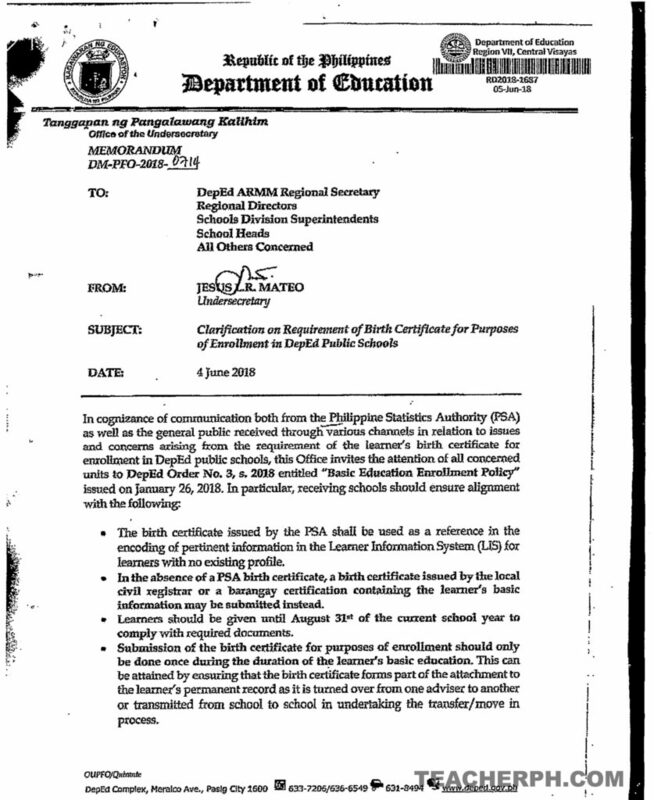 Attention is invited to paragraph 1 and its sub-paragraphs of the said Memorandum, relative to the clarifications on the use of birth certificate upon enrollment, on the alternate use of the local civil registered birth certificate/barangay certification with the learner’s basic information, on the deadline of its submission and the frequency of its provision. The birth certificate issued by the PSA shall be used as reference in the encoding of pertinent information in the Learner Information System (LIS) for learners with no existing profile. In the absence of a PSA birth certificate, a birth certificate issued by the local civil registrar or a barangay certification containing the learner’s basic information may be submitted instead. Learners should be given until August 31st of the current school year to comply with required documents. Submission of the birth certificate for purposes of enrollment should only be done once during the duration of the learner’s basic education. This can be attained by ensuring that the birth certificate forms part of the attachment to the learner’s permanent record as it is turned over from one adviser to another or transmitted from school to school in undertaking the transfer/move in process. Please also be informed that per the clarification from the PSA, the birth certificate issued by the National Statistics Office (NSO) has no expiration and is the same as the birth certificate issued by the PSA. This is because the NSO is one of the four statistical agencies that were merged under Republic Act No. 10625 in order to create the PSA, As such, the NSO copy of the birth certificate can be used for purposes of enrollment and it is needless to require learners to secure a new PSA birth certificate. Should you have further clarifications on the matter, your staff may contact Ms. Susan Anne A. Quirante of this Office at telephone number (02) 633-7206/631-8494.